We have had the opportunity to facilitate a review for some fun hair and other accessories from Pomchies . Although we received samples, our review is honest and unbiased. I love finding new and fun ways to accessorize. My daughter and I are girly girls, we like doing our hair up and looking pretty. We both seem to like things that are different, that make us stand out from the crowd. I came across Pomchies and instantly thought it was an adorable idea. We got all kinds of compliments about our Pomchies. A couple mothers at my daughter's school asked if I would send them some information about the site so they might get some for their little girls. 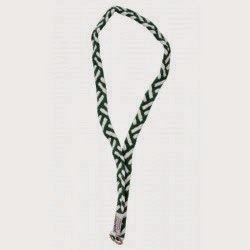 Pomchies are made out of a nylon/spandex material, like the material of swimwear. Pomchies have also been selling at major retailers across the United States such as Target, Bed Bath and Beyond and many more. Pomchies is a certified women owned business. It all started with scrap. They were invented while Heather Logan, owner of Pomchies, was figuring out a way to use the scraps from a swimwear factory. She had been selling children's sun protective swimwear, and the factory in Australia searched for a way to use the leftover fabric. Scraps don't work anymore but the Pomchies idea certainly does. Pomchies is now purchasing fabric by the container load, and has expanded their line. 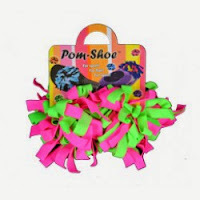 Pomchies has many ideas about how to use the Pomchies, and color combinations to meet every request. They have many new products on the way. 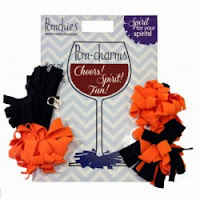 The Pomchies line includes Pom-Keys, Pom Braid and Double braided Headbands, Team-Twist Braid Bracelets, Pom-ID's, Pom-Shoes, and Wine Glass Charms. Pomchies are an adorable way to stand out in the crowd, and a fun way to show off your style or team spirit. The Pomchies are washable. I love that they are functional and the ideas are endless. They would be a perfect stocking stuffer. You can connect with Pomchies via Facebook , @PomchiesLLC , Pinterest , You Tube and Website . I love that they were started by using scraps and it is a woman owned business. The Blossom Clips would look adorable on my daughter~! My girls would love the cute hair accessories-very colorful. Cute! My neice would love the colors! These are adorable ribbons and accessories and any girl would love them. I love the colors and the different styles. These are so cute and they could add color and fun to shoes. My girls would love those. Will be so cute for stocking stuffers!